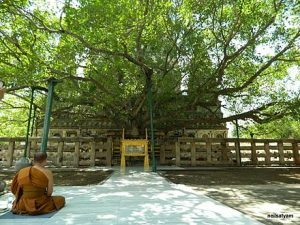 One of the most sacred pilgrimage places in India is the Bodhi tree where Lord Buddha became enlightened. It was then he declared, “I am awake!” Join us for this opportunity to awaken our own “bodhichitta” and consciousness within, as we meditate in this place. For 25 centuries Bodhgaya has been the epicenter of the Buddha’s teachings that have now spread around the world. The extensive temple-park complex, created by Emperor Ashoka, is a place for quiet reflection, meditation and contemplation. Seven sacred shrines commemorate the seven weeks the Buddha spent here after his enlightenment. There is a “meditation park” strictly reserved for serious meditation. Our hotel is a short walk from this holy spot, and we can return several times during our stay. While the powerful Mahabodhi Temple complex is the focus of our visit, the town around the temple is also a haven for those inspired by the Buddha, and a joy to explore. Traffic is restricted, devotees and pilgrims walk everywhere, and we’re a short walk to many beautiful temples and monasteries, built by devotes of different Buddhist lineages, each in their own unique style. Some of these will also be our meditation destinations. Here an infinite variety of Buddhist traditions come together harmoniously. We’ll also drive 12 kilometers into the countryside to meditate at the Dungeshwari or Mahakala caves where the Buddha did his sadhana for several years leading up to his enlightenment. This pilgrimage will be led by Keshava and Daya Taylor, spiritual directors of Ananda Sangha Delhi. The pilgrimage begins at Gaya airport after lunch on Thursday, 31 January, and ends at Gaya airport after breakfast on Sunday, 3 February. Bus meets flight and takes us to hotel. After check in we will have an opening gathering at hotel at around 4 pm. Then we walk to Mahabodhi temple for meditation and come back to the hotel for dinner. Morning meditation at Indosan Nipponji Japanese temple. After breakfast we will have a guided tour of Mahabodhi temple followed by insightful, relaxed activity after lunch. 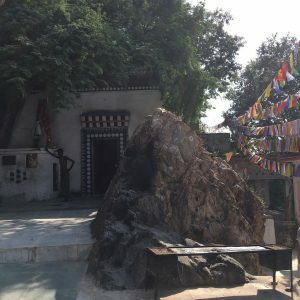 We will meditate in the Dungeshwari Caves early in the morning and after breakfast we will take a walking tour of local temples and monasteries. After lunch, it is free time; you may choose to meditate in Mahabodhi temple. Early morning meditation at Mahabodhi temple. After breakfast, we will check out of the hotel, & visit one more spiritual destination on our way to the airport. Our hotel in Bodhgaya for 3 nights is the 3-star Maya Heritage. Breakfasts and dinners are included. Within Bodhgaya town our destinations are within a 10-minute walk of our hotel. Airport transfers and the outing to Dungeshwari Caves will be by a/c bus. To reach the Dungeshwari Caves involves a 10-minute moderately steep walk up a cement path. If this is difficult, motorcyclists also offer rides. You will arrange your own flight. There is just one flight per day connecting Bodhgaya with other Indian cities. These times can vary slightly. Arrive: Air India #433 departs Delhi 12:00, arrives Gaya 13:40. Depart: Air India #433 departs Gaya 14:15, arrives Delhi 16:55. From other cities you can connect in Delhi with AI-433 flight, on the same day. If you come by train you would make your own way to our hotel from Gaya Railway Station which is 30 minutes away. Double Occupancy: Rs. 17,000 per person. Single Occupancy: Rs. 22,300 per person. 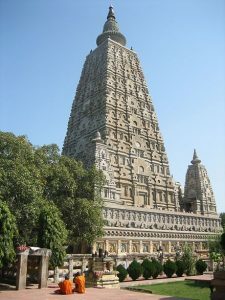 Programme fee includes all group transportation in Bodhgaya, lodging and 2 meals a day, airport transfers for the indicated flights, and hotel tips. Not included are airfare to and from Gaya, lunches, beverages, personal trips in taxi or auto, and personal hotel expenses such as laundry or room service.